A question that is often asked in marketing departments across the B2B world – so how do we integrate these new inbound marketing elements using various social media features with our existing outbound marketing efforts? This can be very easily done by taking just a few inbound activities and combining them with a few traditional outbound activities for maximum effect. In fact, in the example below, you will notice that value is added at each stage of a simple integrated marketing plan centered on a seminal company event – a new product launch. 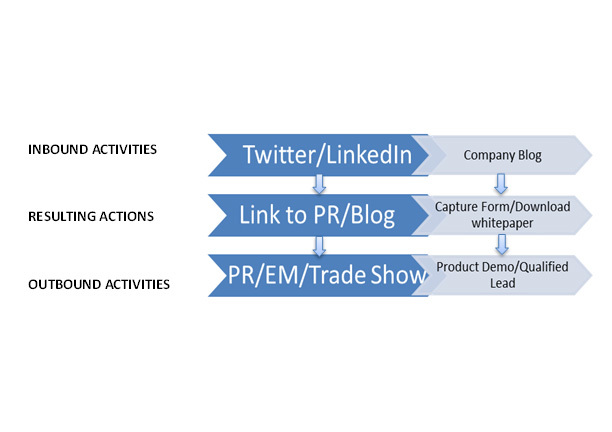 So let’s begin by laying out the product launch plan scenario and its associated components below. Your company is ready to release a new product in a few weeks and related to this launch, it is going to put out a PR on the wire early AM tomorrow. The new product is also being demoed in a couple of weeks at your company booth during a very important industry trade show, which is referenced in the PR. In addition, marketing collateral, including a product datasheet and a related white paper has also been developed. Using the company’s Twitter handle, send a tweet every six hours over the next 24-hour period with appropriate messaging/links to the actual PR on the company web site. Dedicated company salesmen and other marketing representatives may each choose to disperse a similar message/link just once via their individual LinkedIn accounts. The PR landing page must display a complete text of the actual PR, which should offer a call to action early on within the text of the PR. This call to action must provide the visitor an option to link to the company blog – where, after a summary product description, a company whitepaper (including datasheet) related to the new product should be offered for download to the visitor upon filling a brief form (name/company/e-mail address). Visitors, who choose not to fill this form, should be directed to a product datasheet-only page after being politely reminded again of the upcoming product demo at the trade show two weeks out. Over the next ten days, all visitors who have completed the form for whitepaper download must be sent a personalized e-mail from within the company CRM system by an appropriate marketing staff member. This e-mail should offer a personalized demo to each visitor who will be at the trade show. If the visitor responds to the e-mail offer, they are now a prospect, so it is best to confirm a specific demo time slot for this prospect. Requisite sales person will need to be present during each personalized demo at the trade show. Using the company’s Twitter handle, every day for a week prior to the trade show, re-tweet once daily a reminder of your company’s product release announcement and its demo at upcoming trade show. During trade show, additional non-scheduled visitors who sit through the demo should be presented a hard copy of the whitepaper with post-show follow-up action in the usual fashion. Previously scheduled visitors who keep their demo appointments can be offered additional product-related incentives (such as a discount). campaign, in that, your company will generate qualified leads using this approach. If your company relies on purely outbound activities–such as PR and trade show, even when they are linked together–do not produce the same quality of leads as an integrated campaign. More importantly, standard metrics can establish that these integrated marketing campaigns are also more cost-effective in generating qualified leads for your company.